Day three was an eye-opener. 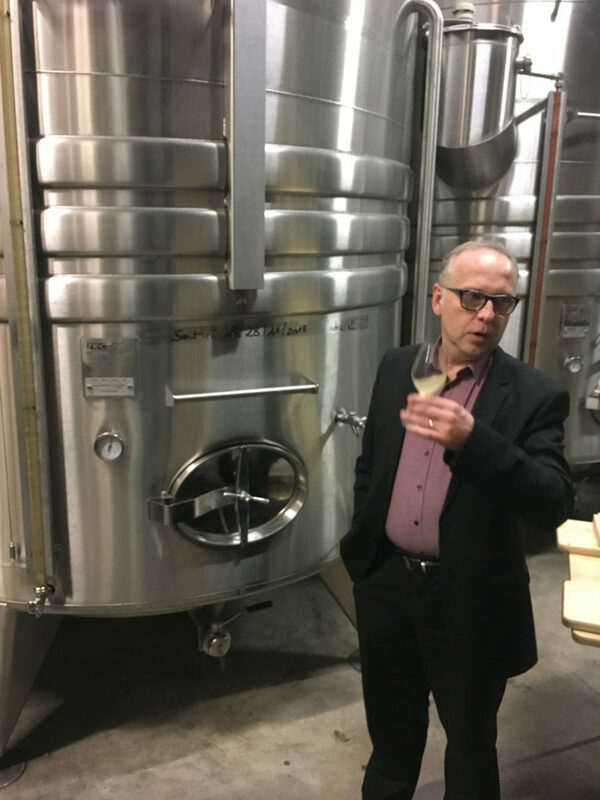 Gerald Talmard introduces us to his friends and neighbors in Chardonnay, we gorge on wine soaked meat with the Jambon family @ Domaine Thulon, and finish up at Louis Picamelot’s brand new winery to taste what have to be the finest set of non-Champagne bubbles in France. Our visit to Talmard is always quick, as this is an efficient father/son operation with only two wines produced. There is not much to talk about really as Gerald makes the best QPR Macon Chardonnay on the market and we beg for as much as he will give us. Talmard typifies 2018 as “2015, but more acidity”. He is right. Talmard 18 Macon Chardonnay, fresh, good acidity, citrus, easy to drink. Talmard 18 Macon-Uchizy, similar in style, more closed at this point. 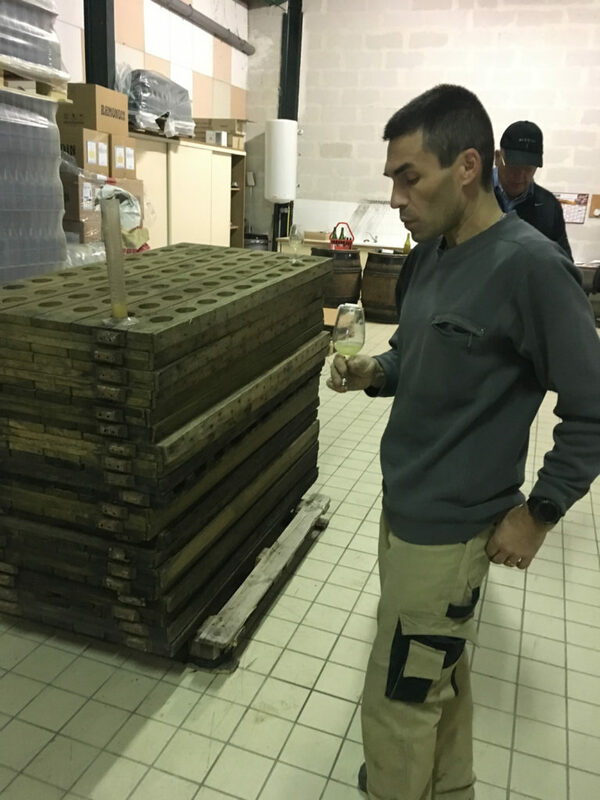 He is playing with a new fermentation process that allows for lower use of SO2, and maybe that was where that extra paintbrush of Chardonnay goodness came from…We’ve rarely tasted wine this good at Talmard. Overachievement. 50,000 bottles available, 10,000 more than with the 2017! Let’s have some fun! All of you have such an appetite for Gerald Talmard’s bombastic values in Macon Chardonnay and Macon Uchizy that he simply cannot supply all of your demand! For this reason Gerald introduced us to his friends and neighbors at Cadoles de Chardonnay. This father/son operation is located several minutes from Gerald’s Domaine, and smack dab in the aptly named village of Chardonnay. 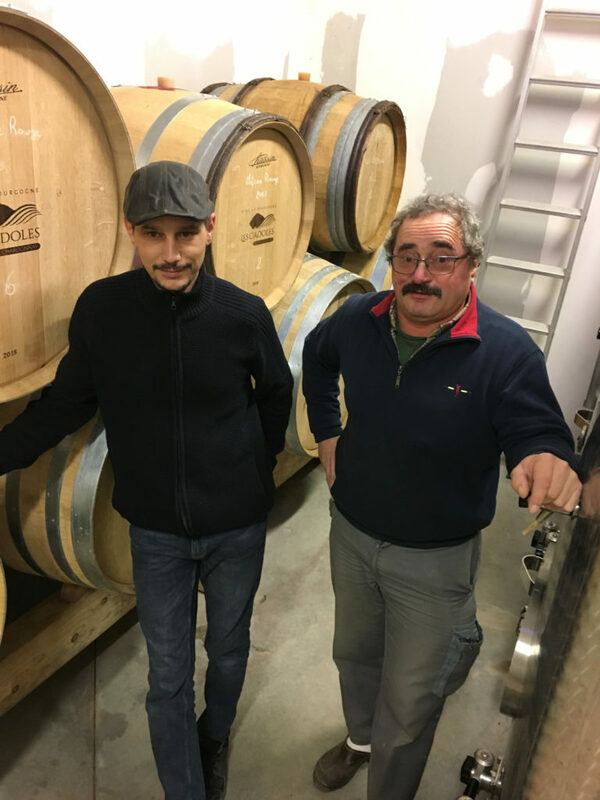 Until several years ago the Domaine was selling all of their production to the local cooperative in Lugny, but they now make and sell wines themselves as their quality is just too good to be lost in a village blend. Here we have a family with deep/long ties to the land, and believe it or not they farm 10% of the total acreage in Chardonnay, all planted to Chardonnay of course! Everything is fermented in stainless steel, and most everything is aged in stainless steel save a dozen experimental barrels. Cadoles de Chardonnay 18 Macon Chardonnay, lemon color, soft, fine, more complex and concentrated than Talmard. Priced a bit higher than Talmard but seems justified. Big opportunity here. You can expect our first load in Spring 2019. Available in all states. Domaine Thulon is located on the old estate of Château de Thulon (this castle towers over the Domaine), and was purchased by Annie and René Jambon in 1987 after they were “métayers” for 20 years on the same site (if the “métayer” thing, ie French sharecropping, is interesting to you have a look at this article by Andrew Jefford) Their children Carine and Laurent are now running the estate, and a passion for experimentation sets them apart from peers in the region. These are some of the best values in French wine we’ve come across in the last decade. Domaine de Thulon 17 Beaujolais Villages Blanc “Montagnier,” wood aged, a little funky, why throw wood at such a good thing? The 18’s are going through what seems a somewhat difficult phase. 17’s were bottled not so long ago and need some time. The cellar and the wines were very cold. The Beaujolais Villages and Chiroubles are made by carbonic maceration. The others are vinified classically (Burgundy-style). Everything takes place in a charmingly typical cellar for the area (have a look at our 360 photos here and more your cursor around for the full experience). 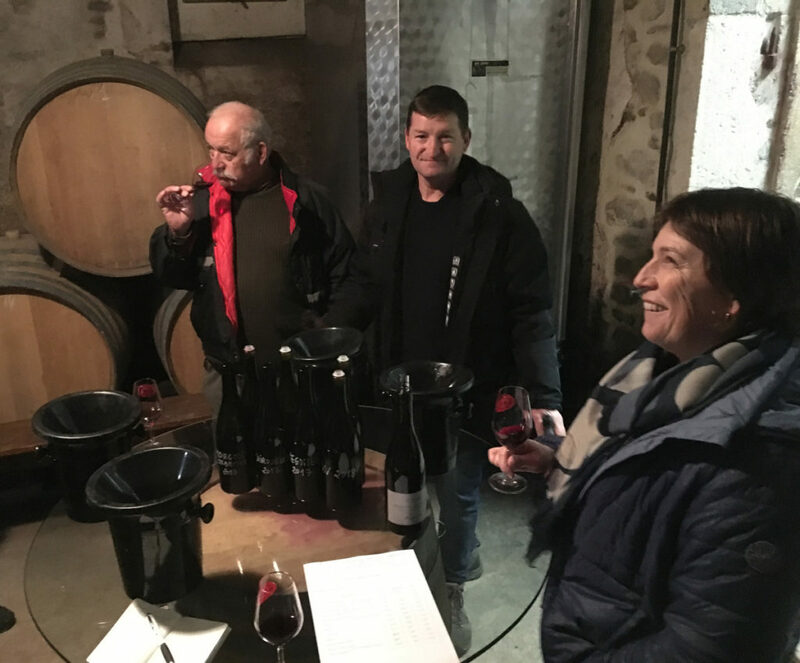 After tasting we crossed the courtyard to dunk assorted meats into steaming pots of Beaujolais wine with the family – I’m trying to find a recipe link for you here but cannot find a thing. Try this though…Simply pour a few bottles of Beaujolais wine into that dusty fondue pot someone gave you as a wedding present, add a chopped onion, a few cloves, some pepper, a few bay leaves, a bit of chicken stock, and a good dose of salt….sit around the table and dip meat into it….proceed to drink copious amounts of Cru Beaujolais. Finish the meal with a wide assortment of cheese. Now you are partying like the Jambon Family. What a way to warm up a blustery afternoon. Phillippe Chautard is the newest generation in the Picamelot family tree to operate this venerable sparkling wine house in Rully. We are safe to say these are the finest sparkling wines made in France outside of Champagne, and some of the top bottlings will beat plenty of Champagne when tasted blind. Mr. Chautard just finished the construction of a breathtaking new winery which is cut into the side of a hill. Have a look at our newly posted 360 photos on Google Street View. Louis Picamelot Crémant de Bourgogne 13 “Jean Baptiste” 80% Chardonnay, 20% Aligote, older, mixed opinions here, you probably won’t see this from us other than via presell. Excellent wines. Informative back labels. So much potential. 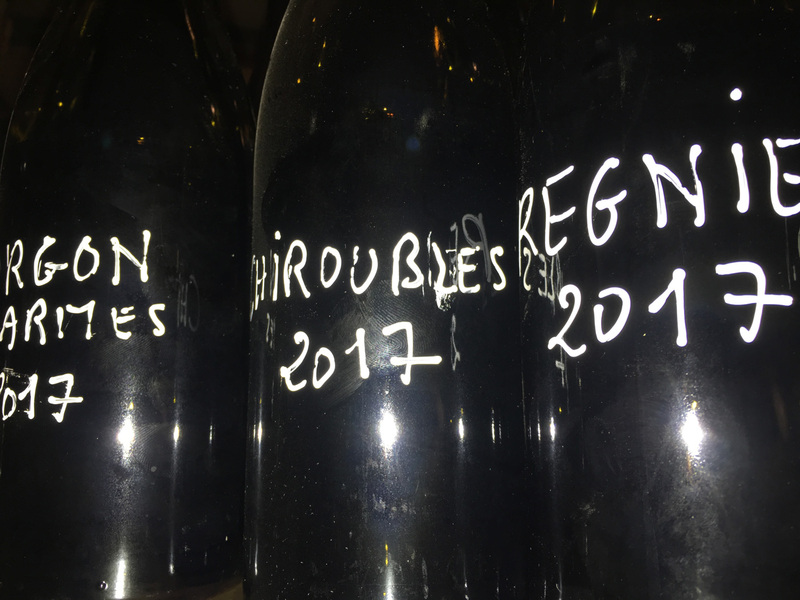 Plenty of others feel the same way that we do about Picamelot, so keep in mind that overall quantities are limited here (certainly not the norm for a sparkling house, especially one producing Cremant de Bourgogne). Up next is a few days in the Rhone with our good friend Harry Bosmans.